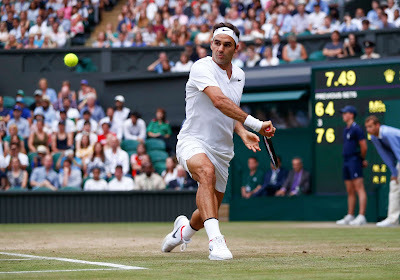 Third seed Roger Federer hammered 61 winners to just seven errors and won 83 per cent of his first-serve points to prevail over the 28th seed Mischa Zverev 7-6 (3), 6-4, 6-4 in one hour and 49 minutes. The victory puts Federer into the second week at Wimbledon for the 15th time. “I had really good focus on my serve today. It was avoidable not to be broken in the first set, but then I hung on down break point at 5-5 in the first set. That was definitely a key moment. The serve is clearly important. Good servers do usually quite well here on the grass,” said Federer. “It's important to get through the first week with a good feeling and I think I got that. The first goal is to get through to the second week and I am happy to sit back and relax and then come back on Monday. “I had more problems with my cold than my opponents,” he said after a third successive match without dropping a set. Federer improves his ATP Head to Head against Zverev to 5-0. Three of those wins have come on grass, including a straight-sets win two weeks ago at the Gerry Weber Open in Halle and a double-bagel victory at that same event in 2013. He'll next play 13th seed Grigor Dimitrov, who moved through after Dudi Sela was forced to retire because of a right adductor strain in their third-round clash. The Bulgarian was leading 6-1, 6-1 before play came to a close. Federer leads his Head to Head against Dimitrov 5-0, but all of their meetings have come on hard courts. The Swiss maestro won their lone match at a Grand Slam in the third-round of last year's Australian Open. The 26-year-old Dimitrov is yet to drop a set as he prepares to contest the fourth round at SW19 for the second time. The right-hander went on to reach the semi-finals in 2014 (l. to Djokovic). He reached his second Grand Slam semi-final at the start of 2017 in Melbourne, losing out to Rafael Nadal in five sets.